Mixed media artwork and poetry on the theme of sewing and female identity by Katherine Kadish and Jackie Bartley. 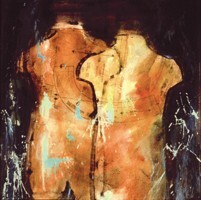 Kadish is an accomplished visual artist, working in painting, mixed media constructions and printmaking. Her work in this exhibition utilizes pattern designs and model forms to construct physical representations of body structure and self-image. Bartley's poems explore the shared cultural experiences of sewing and handiwork that have traditionally shaped the identities of young women.